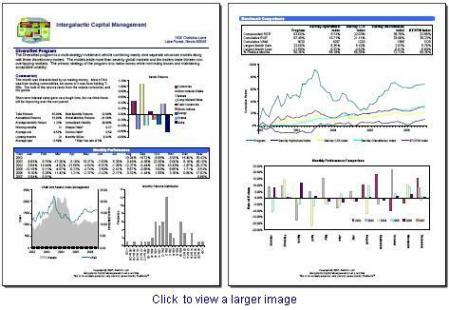 All advisors create a monthly Tear Sheet describing their program, its performance in the prior month, as well as the performance since inception. The document also includes a number of statistics and typically contains comparisons of the advisor’s program with one or more benchmarks. Many advisors find the development of these documents tedious at best and the thought of producing them in the first week of the month unthinkable. For users of TheBooks, the process is fully automated since TheBooks includes a monthly summary template which automates the production of this critical piece of marketing documentation. Because the data comes directly from TheBooks, the document can be produced as early in the month as desired. The author of the tear sheet works in the familiar Microsoft Word environment and has a wide range of document parts to work with. Since the tool is Word, document layout, fonts, colors, and chart appearance are all under the control of the author. TheBooks simply fills in the data as required. Where do the benchmarks come from? TheBooks includes the eight industry-wide Barclay indices and allows you to include user-defined benchmarks. User-defined benchmarks are defined within TheBooks using the Data Manager. Once defined, TheBooks automatically obtains the data and makes it available for reporting and comparison purposes. As a CTA, you must create a program tear sheet on a monthly basis. For users of TheBooks, the process of creating this important piece of marketing material is greatly simplified through the use of provided templates, the immediate access to performance data, and the availability of standard and CTA-specific benchmarks.